Epic conclusion to the series complete with extended action sequences and final forms revealed. Battle with Bloody Mary. 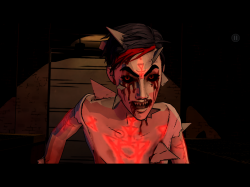 The current existence of Fabletown is put on "trial"
The Wolf Among Us Episode 5: Cry Wolf is the conclusion to the series and has Bigby confronting the Crooked Man in his home about his involvement in the murders in Fabletown. The Crooked Man, who is surrounded by the Jersey Devil, the Tweedle brother(s), Georgie and Vivian, is very accommodating to Bigby. However, Bigby wants to cut to the chase since this entire ordeal complete with attempts on his life, has gone on too long. The Crooked Man prevents any of his associates from attacking Bigby and allows Bigby to ask his questions during this time. And he simply denies all of Bigby’s “baseless accusations” but states that he does know who committed the murders. And he not only identifies one of his associates but tells Bigby that he can take this individual. Of course the person objects to this betrayal and refuses to go. This causes tension among the group and descends into arguments and shoving. None of this matters to Bigby because he wants to take the Crooked Man into custody too. This is when all hell breaks loose, and it’s no coincidence that this occurs when Bloody Mary appears to do the Crooked Man’s bidding. 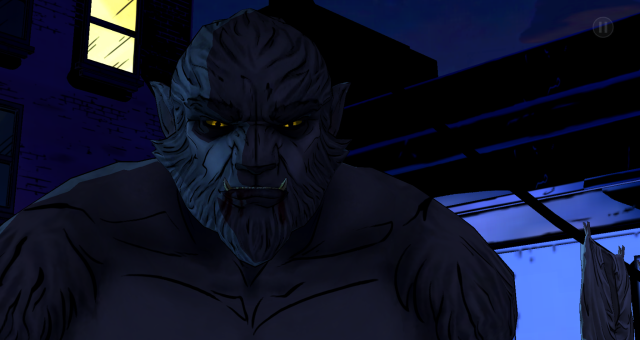 A fight ensues and all parties flee due to turmoil and being unable to beat Bigby. Georgie and Vivian head in one direction due to Georgie being critically injured, the Jersey Devil and Tweedle(s) flee in another direction, and the Crooked Man and Bloody Mary attempt to escape as well. It’s not possible for Bigby to chase all of them simultaneously but one thing is certain to Bigby: the systematic destruction of Fabletown at the hands of the Crooked Man and his associates ends tonight. I was anxious to start this episode considering the way the last one ended by basically serving everyone up on a platter surrounding Bigby. I knew there would have to be a lot of action but it was also clear that all the crucial answers would be given as well. The dynamic conversations worked as well as last episode, which to me was the best they’ve ever been. However, the content of these conversations was more intense than the previous ones because of the situation, and not knowing who, if anyone, would attack Bigby. This was a very engrossing moment as the Crooked Man stood in stark contrast to the behavior of his associates. And even though answers were being given about the murders, the Crooked Man was a new wrinkle who represented everything that was revealed about Fabletown during Bigby’s investigation, so it was clear everything would be addressed throughout this episode. And just like the aspects of the story would come together so too would the gameplay mechanics as this situation would turn into an extended action sequence that was enjoyable on many levels. Whether it was battling the Crooked Man’s associates at the same time in the room or racing across rooftops attempting to land on one of their cars, it was all electrifying. And the results varied not just based on your choice of which car to pursue but how successful you were with the QTE actions, which were significant. And the controls were very responsive so the immersive feeling wasn’t lost due to unresponsiveness or frustration this time around. The fact that this was an extended sequence was perfect for this episode considering much of the pieces had already fallen into place with the story and the only remaining pieces would clearly be wrapped up soon. Considering how the story and the characters have been two of the strongest aspects of this series it was so good to see certain characters be dealt with in a fitting manner and with satisfying answers. 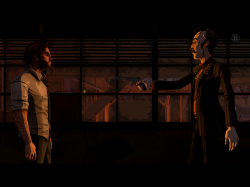 So the interactions immediately after the car chases were mostly about filling in the blanks of everything that has been occurring with a couple of choices reflective whether you want Bigby to be more “humane” or more sadistic. The answers were really good and given early in the episode so I don’t want to overlook that because they were key to enjoying the episode. However, there was a battle that took place that absolutely blew my mind, and was BY FAR the most amazing action sequence from Telltale Games, and incredible by any standard. I don’t want to give any spoilers about this so I’ll just say true forms were revealed and they’re glorious. Bloody Mary is truly a memorable antagonist and she will haunt your memories the same way she has done to children for generations. But so will Bigby, and it’s easy to understand after this battle how giving in to his baser nature could’ve been so addictive to him in the past. This battle could’ve been a climax in any other game, and it definitely was the apex in the series up to this point but there was a lot of story left even after this. And this didn’t feel like a long endgame but actually crucial to the series and one of the benefits of building up a great story and such a fascinating world. There were many factors, or rather, deficiencies in Fabletown that the Crooked Man and his associates capitalized on in order to manipulate people, as well as their own desires to living luxuriously. So, in essence, Fabletown would be put on trial and all your actions as Sheriff would be too. This was very interesting and I was surprised at how much I was enjoying this part. Regardless of how one made Bigby behave throughout this series what is certain is you will have a complete understanding of Fabletown, its residents and their motivations, and have to contend with that. So all the character development was definitely worth it as this part was true to the tone of the series and was also satisfying. From the beginning of this series none of the issues were treated in a simplistic black and white manner, and in ways tried to offer commentary on society. The characters in Fables were already fascinating before The Wolf Among Us but this series was successful in showing in an engrossing manner what was basically a group of immigrants forced to flee their homeland while struggling to make things work. So the murder mystery was the mechanism used to explore this world and pull one in completely. And with the twists in the last part of this episode it’s a world that’s definitely worth visiting more than once. 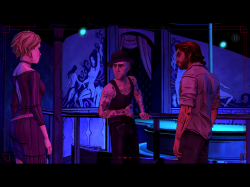 The Wolf Among Us Episode 5: Cry Wolf is an epic conclusion worthy of the greatness exhibited throughout this entire series. This episode is intense from the beginning during the standoff with the Crooked Man and his associates right to the very end when the credits start rolling. It’s as close to a storytelling masterpiece as possible especially considering one’s influence over major decisions throughout the course of this series. There were some slight bumps along the way with the speed of the conversations and unresponsive controls but the fact that this was all improved before the last 2 episodes says a lot about the dedication of the developers and creating a rewarding experience for the player. 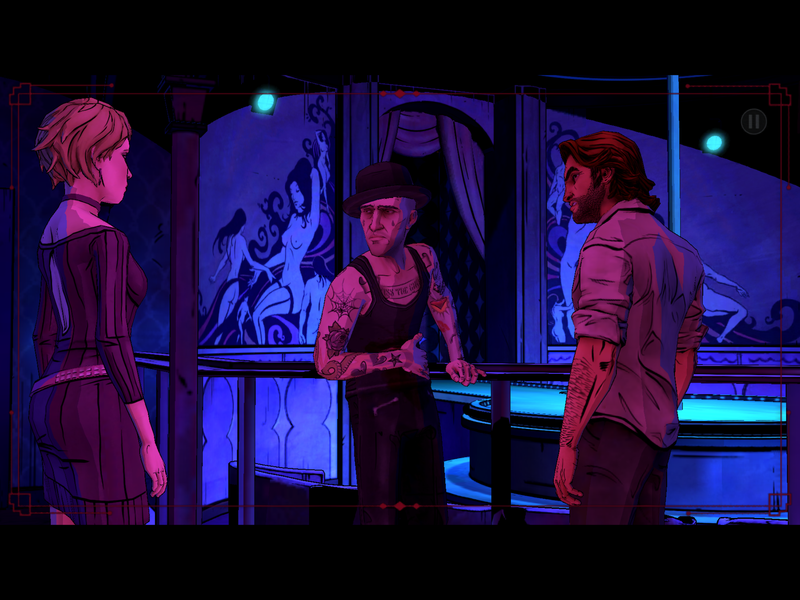 And there have been many occasions where the conclusion doesn’t live up to expectations but it seems as if Telltale Games has found the right formula once again, I highly recommend The Wolf Among Us, and whether you’re already a Fables fan or not, it’ll be a truly memorable experience. I’m glad the crooked man is dead. What a jerk.